Brandbox is a digital platform and service launching physical stores at speed and scale, easily and quickly. It is aimed at digital native brands willing to diversify and attract new customers through physical retail. Macerich, the third largest mall owner and operator in the United States partnered with FITCH to develop a new service. As part of a new strategy, they wanted to target and attract Digitally Native Vertical Brands (DNVBs) to their malls. That's how Brandbox was born, as an innovative all-in-one solution to go from digital to physical, hassle free. I joined the project as UX designer in FITCH's London based digital team. 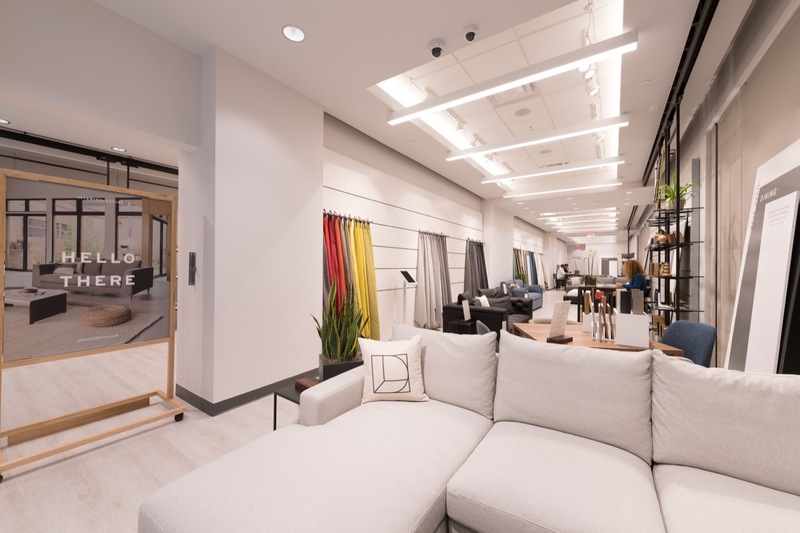 From start the goal has been to work closely with Macerich's US team on the service and digital design side of the project, while two other teams collaborated on brand (FITCH New York) and space design (Columbus). → Absence of reliable analytics. The project started at the very end of 2017 and was first considered through a service design and strategic discovery phase. A huge amount of work was done in field and user research at that point. Stakeholders interviews gave the team a solid understanding of DNVBs' needs and potential fears when it comes to going physical. It also highlighted pretty clearly that in order to be a success, the service should become an integrated B2B platform similarly to what Shopify or Wordpress are doing in order to streamline a process perceived as complex, clouded and that confused digital brands. We defined very early on that the high number of stakeholders was one the main pain points in the process of opening a store. Actually mapping and understanding the relations between every one of them helped us a great deal to define the critical role of facilitator Brandbox would have to play in the process. From there we were able to define and refine a critical path, a step by step process leading to store opening. The next step was to draft the service model, service blueprint and structure the upcoming design process for the production of the SaaS platform and associated services. 3/ The 'physical shell', a modular store space shaped through the platform and located in Macerich's malls in the best spots all around the US. 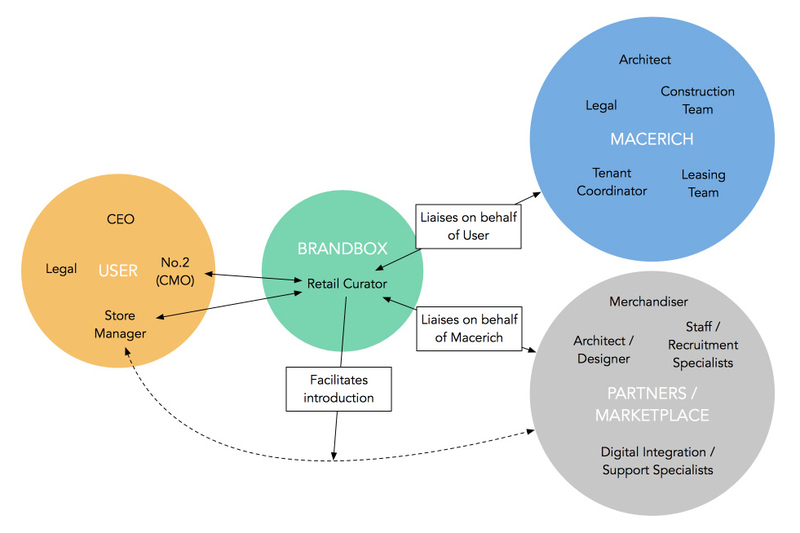 Brandbox's initial service model presenting the steps, stakeholders and resources. The service defined, we started actually designing a MVP (Minimum Viable Product) of the platform that would hold the more crucial tools and elements for initial release, planned in november 2018. 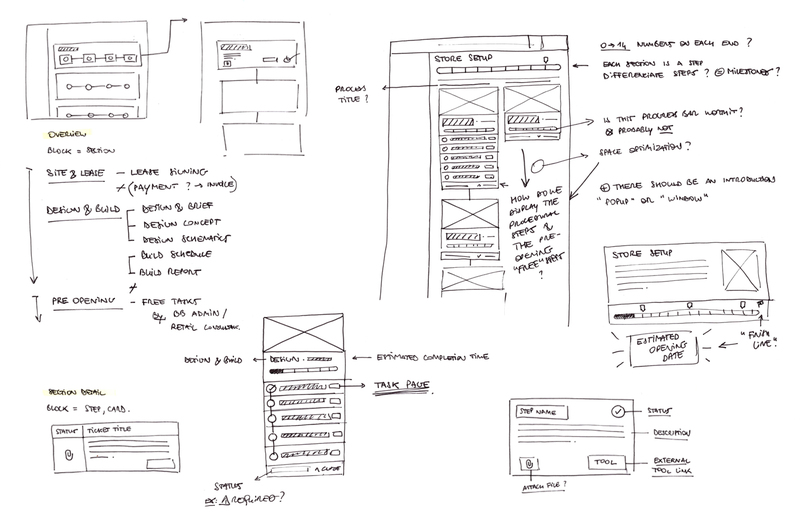 Dan, the UX lead that worked on the platform with me, had already drafted a 'vision' set of wireframes a few weeks before that we used as a foundation. We divided the work per tool or feature and worked collaboratively on them one after the other, often coming back on one or refining elements as the service became sharper. Daily stand-ups and calls with the client really helped us keep a good understanding of the requirement and provide accurate solutions throughout the initial UX design phase. At the early stage of each feature or tool, I often started drafting blocks and elements on paper to quickly structure the pages and get a good sense of the scale. One of the main workflow constraints we had on the project was that the Macerich team had to provide almost daily feedback on the UX. That's why we used Axure RP to produce fast interactive prototypes we could improve on. It proved to be an excellent choice in our iterative process, both for early user testings and to keep the clients on board with the design decisions that were made. Axure RP prototype of the store opening process. 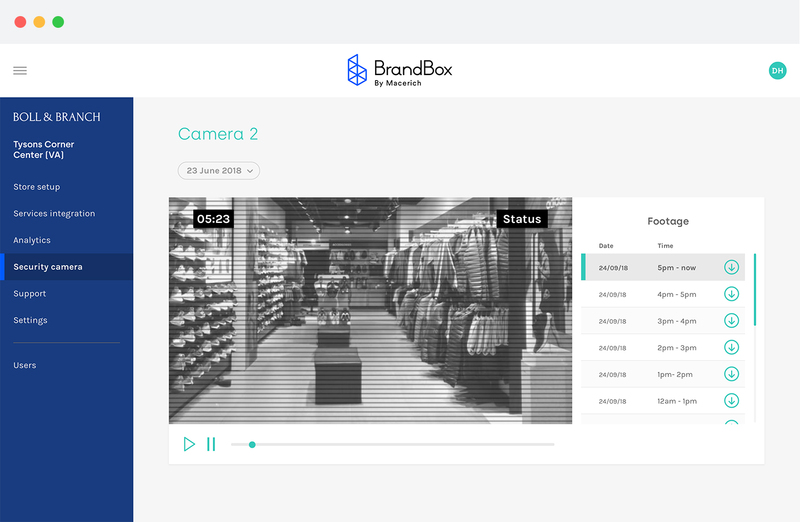 The Brandbox platform is revolving around a set of tools that are interconnected to provide a seamless and hassle free store management experience for digital native brands. It is designed to be used by retail neophytes and backed with the knowledge and expertise of Macerich. The UI and interaction design was done by dedicated designers in our team and we made sure to collaborate tightly to ensure that each section of the platform was implemented in a delightful and meaningful way. 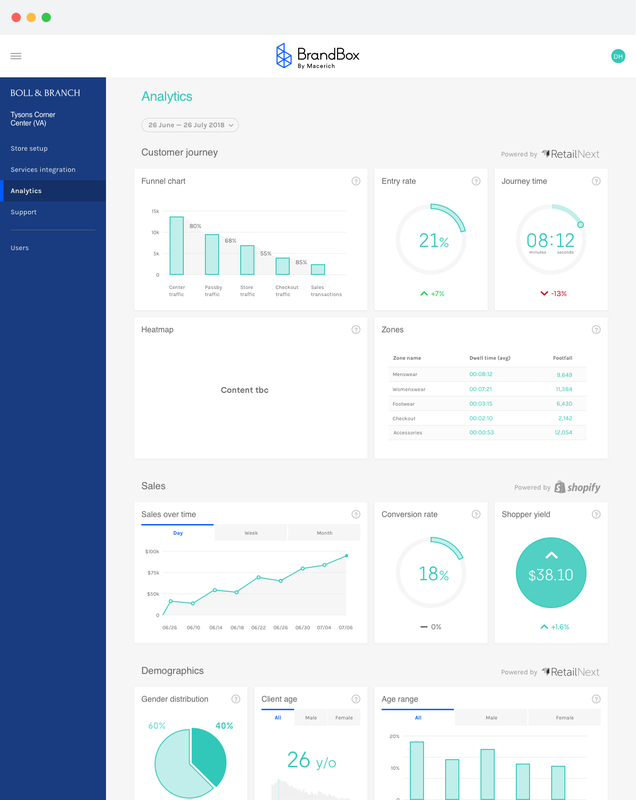 The core tool of the platform, that acts as dashboard during the early stages, is the store opening process. It is divided into main categories that can be composed of linear or non-linear task lists. Each task is defined and linked to a knowledge base for users to learn and undertand precisely what is needed from them and/or what happens. Manual or automatic task validation, document archive and clear progress make this store opening tool both flexible and efficient. As one of the main stakes of the entire project, analytics had to be truly innovative in order to collect valuable insights after store opening and bring great added value to the service. Each Brandbox physical shell is by default equiped with precise, state of the art sensors that provide this valuable information, bridging the gap between digital and physical retail. Brandbox aims at providing all the tools and services required to open and run physical stores with ease. A number of services are included within the package: security, IT and general support, demographics data and more. 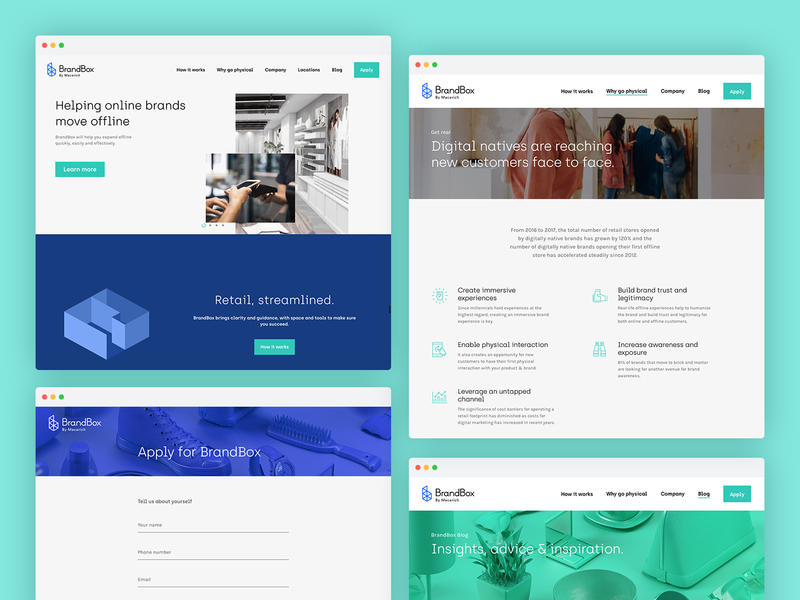 In parallel with designing the platform, we needed to put together a marketing website to drive potential DNVB clients to Brandbox and start putting the word out that an amazing new service was opening the gates of physical retail to the digital world. 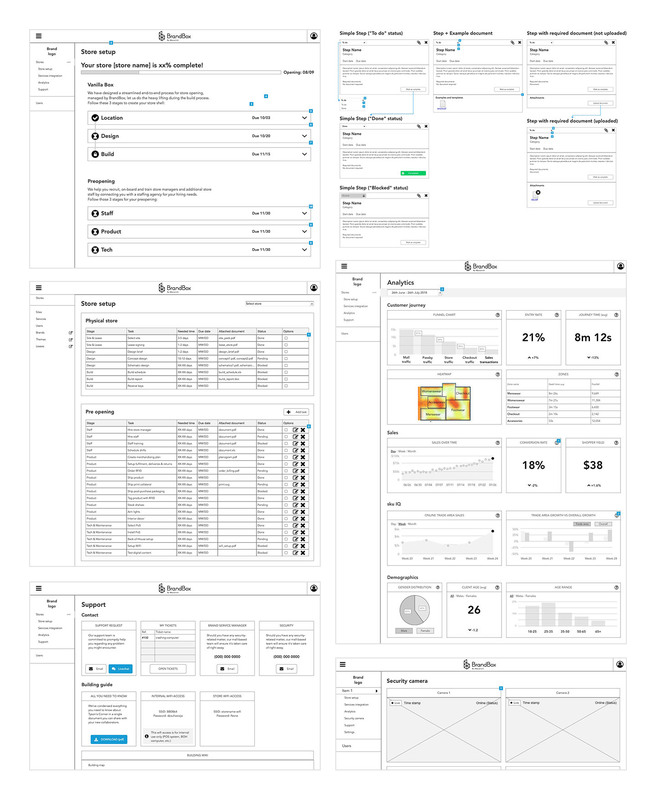 We used a similar design process as for the platform, going through Axure RP for the UX design and laying out a load of wireframes before we got the right balance of simplicity, clarity and expertise reflecting through this few pages. 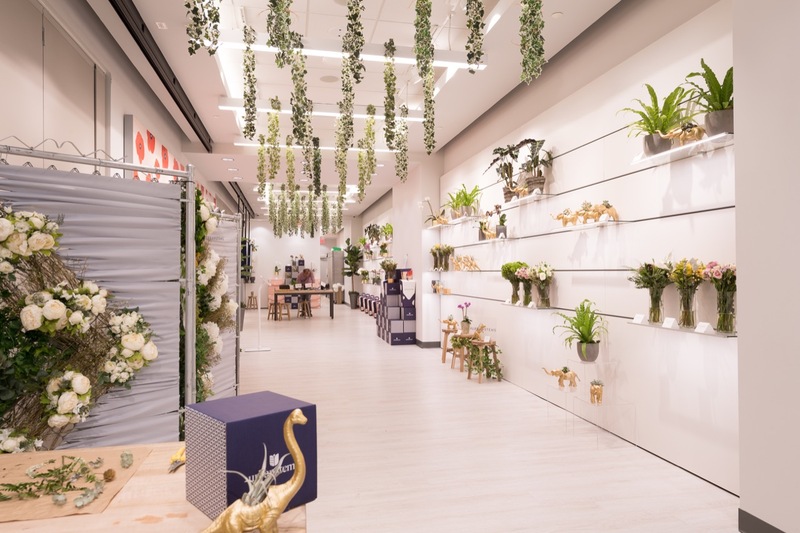 Brandbox's pilot location in Tysons Corner Center (VA) now hosts six open stores from digital brands Naadam, Nectar, Winky Lux, Interior Define, UrbanStems and DKNY. This stores were designed and built over the course of 4-8 weeks and, according to Macerich, the full process from “I want a store” to “My store is operational” is now targeted to be 3 weeks. This represents an average of 20x faster than the original timeline. Brandbox has been featured in Forbes, Glossy, Little Black Book, and an extensive interview of Kevin McKenzie (Chief Digital Officer of Macerich) is available on PSFK. 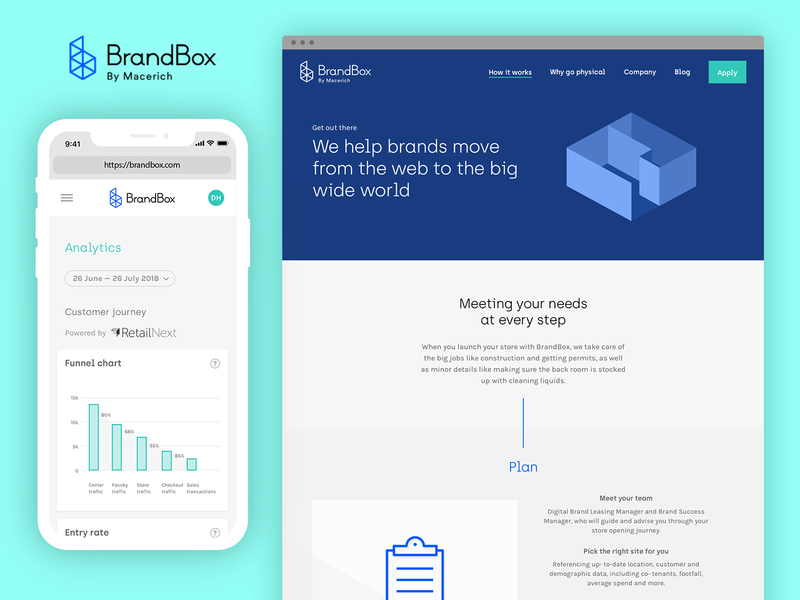 At a personal level, working on Brandbox has been an amazing opportunity to tackle a complex yet rewarding scale of project and experience a very collaborative and efficient workflow that led to design what I consider as a game changing service for the world of retail.